Isabel II inherited the throne in 1833 upon the death of her father, Ferdinand VII. 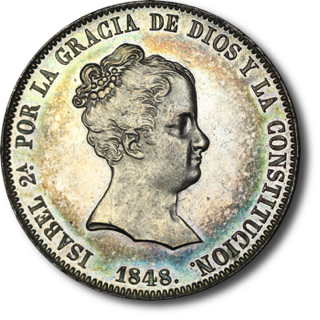 The first numismatic period of Isabel's reign (1833-1848) is referred to as the Kingdom period. 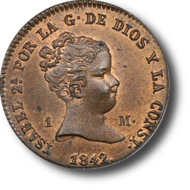 During this time the coinage denominations and appearance continued much as they had in Ferdinand's time except for the introduction of Isabel's name and image. The earliest coins bearing Isabel’s image were likely inspired by the queen’s appearance at court wearing a pearl necklace and earrings with her hair pulled up into a bun topped by a small crown of pearls. 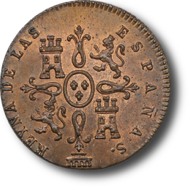 The royal engraver, Mariano González Sepúlveda, created dies depicting Isabel II in a similar manner on copper, silver, and gold coins of the Kingdom period. She was also portrayed thus in a contemporary portrait painted by Carlos Ruiz de Ribera. In 1833 several proclamation medals were issued in silver and gold in sizes similar to existing coins, but without a stated denomination. Many of these likely saw use in commerce based on their weight. A few regular issue 4 reales and 80 reales coins were struck as early as 1834, but most denominations were issued beginning in 1836. At this point in history, Spain was comprised of several political factions. Chiefly, the liberals (also known as Constitutional party) and the royalists who favored the Carlist faction. The liberals were comprised of moderates (sometimes referred to as conservatives), progressives, and radicals. 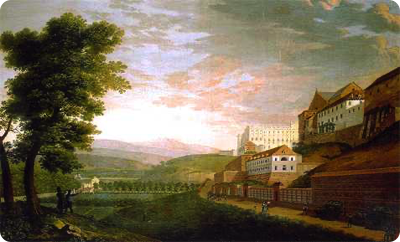 In simplest terms, the royalists were fighting to preserve the old ways under which each town and region was independently governed by various local men of power. The liberals sought a new way in which greater freedom and opportunity was given to Spaniards and wanted to centralize government authority for the purpose of assuring consistent policies in the administration of Spain. Ferdinand VII had led an absolutist government that favored the old ways. In Isabel II the liberals saw an opportunity for change. They sought a return to the progressive Constitution of 1812. 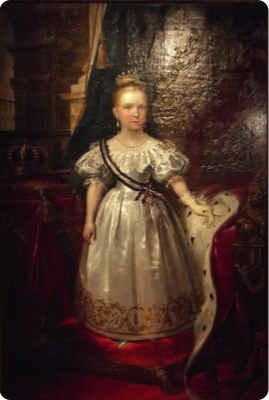 Isabel's mother and regent, Maria Cristina, made overtures to the liberals to assure her leadership. However, she did not seem genuinely supportive of liberal ideals which sought to limit royal power. During the summer of 1836 the guards at the summer palace revolted and forced the Queen Regent to implement a constitutional monarchy. This explains why the decree of 1836 has very little in the way of coinage specifications. Its primary purpose is to assure that “CONSTITUTION” appears on the coins. 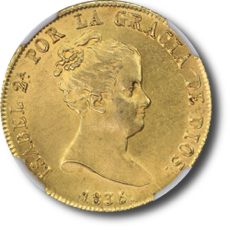 Spain issued only one type of 2 maravedís and most were minted at Segovia or Jubia from 1836 to 1850. However, Barcelona also issued this type in 1858. This is unusual since maravedís had been officially abandoned in 1848 with the change to decimal coinage. This particular example is one such Barcelona issue. It has pleasing chocolate brown surfaces with light areas on the obverse and deep, almost iridescent toning on the reverse. 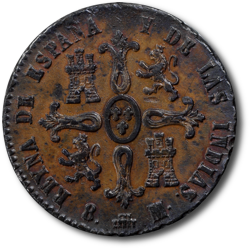 Spain issued three types of 8 maravedís during the reign of Isabel II. All of them pictured Isabel II on obverse and a stylized cross with castles & lions on the reverse. 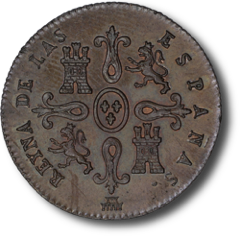 The first type had a legend that ended DIOS with denomination on the reverse, the second type was a crudely cast coin from Pamplona (the only official cast coin of Isabel's reign), and the third was like the first except that the denomination is on the obverse and the legend ends CONST. since the legend was modified to "... GRACIA DE DIOS Y LA CONST." The coin pictured above is of the first type with legend ending DIOS. 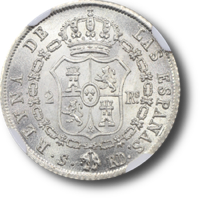 The edge has a laurel leaves pattern similar to those seen on earlier Spanish colonial 8 reales silver coins of 1732-1772. This particular example has rich brown toning with a hint of luster on the obverse and a highly contrasted dark and tan reverse. (1) “Articulo de Oficio.” Gaceta de Madrid. Madrid, Spain. (3 December 1836): No. 728, page 1 (translated). 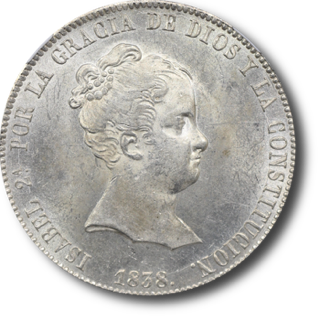 Spain issued two types of Kingdom 2 reales of Isabel II. They are distinguished by the legend, with one ending DIOS and the other ending CONST. All of them pictured Isabel II on the obverse and crowned arms encircled by the Chain of the Order of the Golden Fleece on the reverse. The coin pictured above is of the second type with legend ending CONST. This particular example is beautifully lustrous on both sides. The obverse bears a few marks commensurate with the grade. The reverse is virtually flawless. 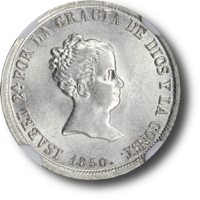 Spain issued two types of Kingdom 20 reales of Isabel II. They are distinguished by the legend, with one ending DIOS and the other ending CONSTITUCION. All of them pictured Isabel II on the obverse and crowned arms encircled by the Chain of the Order of the Golden Fleece on the reverse. 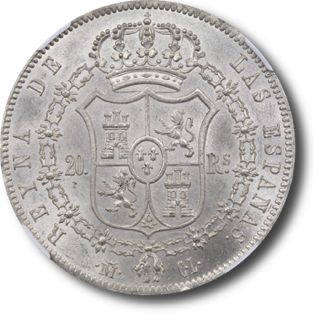 The constant export of Spanish 20 reales during the mid 1800s makes finding an eye appealing example very challenging and Kingdom period 20 reales are the most challenging among these. 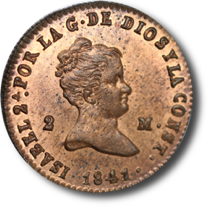 The coin pictured above is of the second type with legend ending CONSTITUCION. At just over 67,000 minted, this is one of the lowest mintage issues of the series. This particular example has lustrous prooflike surfaces with beautiful golden and powder blue toning on both sides. 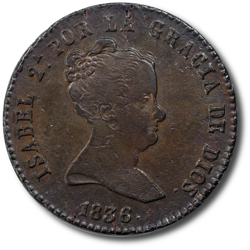 A hint of rub on Isabel's cheek and a few marks and minor hairlines in the obverse fields are overwhelmed by the overall beauty of this coin. The finest example of this date seen by this author and the most eye appealing example this author has encountered of the entire Kingdom 20 reales series. Spain issued only one type of 1 maravedís (1842-1843). 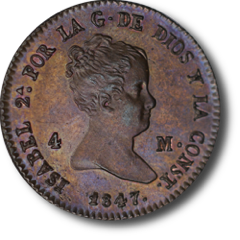 This coin pictured above has lustrous red brown surfaces and almost no marks. An excellent example of the type. 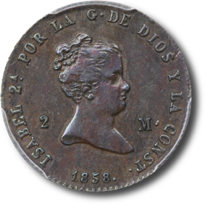 Spain issued only one type of 2 maravedís and most were minted at Segovia or Jubia from 1836 to 1850, with some additional pieces minted at Barcelona in 1858. 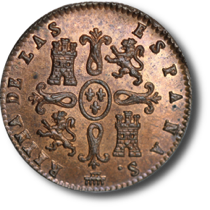 The coin above has lustrous red brown surfaces and few marks. Both sides, especially the reverse, have mirrored iridescent surfaces when viewed in hand. A stunning example of the type. The coin pictured above is of the second type with legend ending CONSTITUCION. With only about 219,000 minted, this is actually the highest mintage of the series. Scarce in grades above VF, this coin is truly rare in uncirculated condition. This particular example has lustrous surfaces with mint frost on many of the design features. The finest example of this date seen by this author. 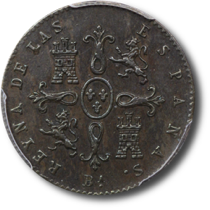 Spain issued two types of 4 maravedís during the reign of Isabel II which are distinguished by the placement of the denomination on reverse or obverse. All of them pictured Isabel II on obverse and a stylized cross with castles & lions on the reverse. The coin pictured above is of the first type with legend ending DIOS. Although a relatively common date, even in uncirculated, the 4M-1847a is seldom found with good eye appeal owing to highly varying quality of planchets, minimal quality standards for copper coins of the day, and the considerable service life and associated wear on dies for most copper coins of this era. This particular example is something of an exception. It has a lustrous brown color that shifts to red and purple toning as it is turned and rotated in hand. 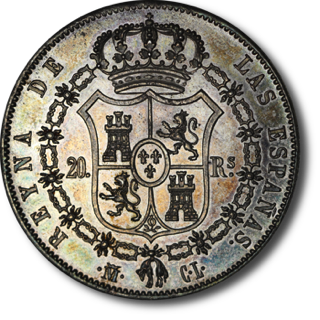 Spain issued three types of Kingdom 80 reales of Isabel II. They are distinguished by the legend ending DIOS, CONSTITUCION, or CONST. All of them pictured Isabel II on the obverse and crowned arms encircled by the Chain of the Order of the Golden Fleece on the reverse. 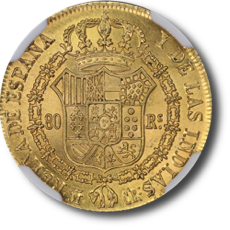 Gold coins of this period saw heavy use as the shortage of silver coins grew dire in the later periods and reliance on gold coins such as these increased. The coin pictured above is of the first type with legend ending DIOS Though a fair number were struck and they are not too difficult to find in circulated grades, they are rare in eye appeaing uncirculated condition. This particular example has lustrous golden surfaces and no distracting marks. An exquisite specimen and certainly among the most eye appealing examples of the type in any grade. Text and coin photos © 2012-2017 - All Rights Reserved. All other photos and exhibits are public domain or used in accordance with their respective license.